^ a: For distribution purposes, Europe and Australasia were divided into two regions by Nintendo. The first of these regions consisted of France, West Germany, Scandinavia and Spain and saw the NES released during 1986. In the Netherlands the console was released in Q4 of 1987. 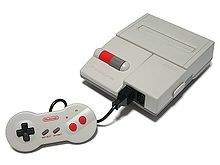 The console was released in the second region, consisting of the United Kingdom, the Republic of Ireland, and Italy, as well as Australia and New Zealand, in 1987. 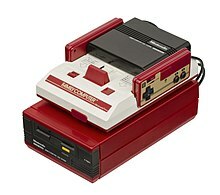 ^ c: The original Famicom featured two hardwired game controllers and a single port for additional input devices. See game controllers section. 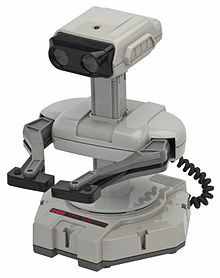 ^ e: The NES was the overall best-selling system worldwide of its time. In Japan and the United States, it controlled 85 to 90 percent of the market. It was not as successful in Europe, where it was at most in ten to twelve percent of households. Nintendo sold 61.9 million NES units worldwide: 19.35 million in Japan, 34 million in the Americas and 8.5 million in other regions. ^ g: Atari broke off negotiations with Nintendo in response to Coleco's unveiling of an unlicensed port of Donkey Kong for its Coleco Adam computer system. Although the game had been produced without Nintendo's permission or support, Atari took its release as a sign that Nintendo was dealing with one of its major competitors in the market. ^ h: Donkey Kong Jr. Math and Mach Rider are often erroneously included in lists of launch titles. In reality, neither title was available until later in 1986. ^ In Hangul, 현대 컴보이 (Hyeondae Keomboi). ^ "Nintendo Co., Ltd. : Consolidated Sales Transition by Region" (PDF). Nintendo.co.jp. Retrieved August 8, 2018. ^ a b c d "Nintendo Entertainment System (NES) – 1985–1995". Classic Gaming. IGN. Archived from the original on November 4, 2012. Retrieved July 19, 2010. ^ a b "Consolidated Sales Transition by Region" (PDF). First console by Nintendo. January 27, 2010. Archived from the original (PDF) on February 14, 2010. Retrieved February 14, 2010. ^ Stuart, Keith (September 13, 2010). "Super Mario Bros: 25 Mario facts for the 25th anniversary". the Guardian. Retrieved November 2, 2018. ^ "Super Mario Bros voted greatest computer game ever". The Daily Telegraph. July 27, 2008. Retrieved July 22, 2010. ^ Goss, Patrick. "The games that sold consoles". MSN. Archived from the original on March 9, 2008. Retrieved September 24, 2011. ^ Sanchez-Crespo, Daniel (September 8, 2003). Core Techniques and Algorithms in Game Programming. New Riders Games. p. 14. ISBN 0-13-102009-9. ^ "How Nintendo Made The NES (And Why They Gave It A Gun)". Kotaku. October 16, 2015. Archived from the original on October 16, 2015. ^ "7 things I learned from the designer of the NES". The Verge. October 18, 2015. Archived from the original on October 19, 2015. ^ "GlitterBerri's Game Translations » Deciding on the Specs". Glitterberri.com. ^ GlitterBerri's Game Translations » Synonymous With the Domestic Game Console. Glitterberri.com (April 21, 2012). Retrieved on August 23, 2013. ^ Kent, Steven L. (2001). The Ultimate History of Video Games: The Story Behind the Craze that Touched our Lives and Changed the World. Roseville, California: Prima Publishing. pp. 279, 285. ISBN 0-7615-3643-4. ^ a b Kent, Steven L. (2001). The Ultimate History of Video Games: The Story Behind the Craze that Touched our Lives and Changed the World. Roseville, California: Prima Publishing. pp. 283–285. ISBN 0-7615-3643-4. ^ Kent, Steven L. (2001). The Ultimate History of Video Games: The Story Behind the Craze that Touched our Lives and Changed the World. Roseville, California: Prima Publishing. p. 287. ISBN 0-7615-3643-4. ^ "Nintendo's Final Solution". Electronic Games. Vol. 4 no. 36. March 1985. p. 9. Retrieved February 5, 2012. ^ O'Kane, Sean (October 18, 2015). "7 things I learned from the designer of the NES". The Verge. Retrieved September 21, 2018. ^ Burnham, Van (2001). Supercade: A Visual History of the Videogame Age, 1971–1984. Cambridge, Massachusetts: MIT Press. p. 375. ISBN 0-262-52420-1. ^ a b Dayton, David (October 18, 2010). "Super Mario's Release Date is Missing!". The Mushroom Kingdom. Retrieved October 8, 2011. ^ a b Edwards, Benj (November 14, 2005). "How to Tell if a Copy of Gyromite has a Famicom Adapter in it". Vintage Computing and Gaming. Retrieved October 20, 2008. ^ "NES". Icons. Season 4. Episode 5010. December 1, 2005. G4. Archived from the original on October 16, 2012. ^ "25 Smartest Moments in Gaming". GameSpy. July 21–25, 2003. p. 22. Archived from the original on September 2, 2012. ^ Cunningham, Andrew (July 15, 2013). "The NES turns 30: How it began, worked, and saved an industry". Ars Technica. Retrieved September 21, 2018. ^ Boyer, Steven. "A Virtual Failure: Evaluating the Success of Nintendos Virtual Boy." Velvet Light Trap.64 (2009): 23–33. ProQuest Research Library. Web. May 24, 2012. ^ "Computerspel komt terug". Krantenbankzeeland.nl. November 11, 1988. Retrieved October 26, 2017. ^ Barboni, Flavio (July 13, 2013). "Master System x NES" (in Portuguese). TechTudo. ^ a b "Playtronic, a história" [Playtronic, the history] (in Portuguese). Nintendopedia Brasilis. 2018. ^ a b Noviello, Renato (2000). "O NES no Brasil" [The NES in Brazil] (in Portuguese). The Nes Archive. ^ Kent, Steven L. (2001) . "The Seeds of Competition". The Ultimate History of Video Games: From Pong to Pokémon and Beyond- The Story That Touched Our Lives and Changed the World (First ed.). Roseville, California: Prima Publishing. p. 305. ISBN 0-7615-3643-4. The Nintendo Action Set, which included everything in the Control Deck packaging plus the "Zapper" light gun and the game Duck Hunt, sold for US$149, as did the Master System and gun set, which included the "Light Phaser" and the game Safari Hunt. ^ a b Andrew Cunningham (July 15, 2013). "The NES Turns 30: How It Began, Worked, and Saved an Industry". Ars Technica. Retrieved October 17, 2015. ^ a b c Edwards, Benj (August 7, 2008). "Inside Nintendo's Classic Game Console". PC World. Archived from the original on July 2, 2010. Retrieved June 23, 2010. ^ "Guru Larry's Retrospective on the regional variations and releases of the European Nintendo Entertainment System". Blisteredthumbs.net. Archived from the original on September 27, 2012. Retrieved October 2, 2012. ^ a b Edwards, Benj (November 7, 2005). 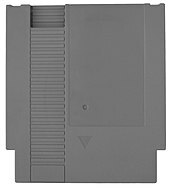 "No More Blinkies: Replacing the NES's 72-Pin Cartridge Connector". Vintage Computing and Gaming. Retrieved June 3, 2007. ^ Nelson, Rob (February 12, 2003). "Nintendo Redivivus: how to resuscitate an old friend". Ars Technica. Retrieved June 3, 2007. ^ Higgins, Chris. "Did Blowing into Nintendo Cartridges Really Help?". Mental Floss, Inc. Retrieved August 6, 2014. ^ Hill, Kyle (July 1, 2014). "We Blow Into Video Game Cartridges Because of Weird Psychology". Retrieved August 6, 2014. ^ Ramirez, Anthony (December 21, 1989). "The Games Played For Nintendo's Sales". New York Times. Retrieved June 28, 2010. ^ "Did Blowing into Nintendo Cartridges Really Help?". MentalFloss. September 24, 2012. Retrieved July 12, 2018. ^ Hongo, Jun (July 15, 2013). "Nintendo brought arcade games into homes 30 years ago". The Japan Times Online. ISSN 0447-5763. Retrieved August 1, 2018. ^ "NES Specifications". Problemkaputt.de. Retrieved November 28, 2015. ^ a b Nutt, Christian; Turner, Benjamin (2003). "Metal Storm: All About the Hardware". Nintendo Famicom—20 years of fun. Archived from the original on December 23, 2005. Retrieved May 21, 2006. ^ "Open Hidden Sound Channels in the NES". Retrofixes.com. Retrieved January 15, 2018. ^ "NES Expanded Audio: 100k Pot Mod". Curriculumcrasher.com. Retrieved January 15, 2018. ^ Nintendo Entertainment System Instruction Booklet. Nintendo. 1989. p. 5. ^ Kent, Steven L. (2001). The Ultimate History of Video Games: The Story Behind the Craze that Touched our Lives and Changed the World. Roseville, California: Prima Publishing. p. 279. ISBN 0-7615-3643-4. ^ Kent, Steven L. (2001). The Ultimate History of Video Games: The Story Behind the Craze that Touched our Lives and Changed the World. Roseville, California: Prima Publishing. p. 297. ISBN 0-7615-3643-4. ^ Nutt, Christian; Turner, Benjamin (2003). "Metal Storm: All About the Hardware". Nintendo Famicom—20 years of fun. Archived from the original on May 20, 2009. Retrieved July 23, 2010. ^ Edwards, Benj (February 23, 2006). "Gotta Love That Fresh "AV Famicom Smell"". Vintage Computing and Gaming. Retrieved July 1, 2010. ^ a b Totilo, Stephen (June 3, 2004). "Revenge of Pac-Man: Vintage Games Are Back". New York Times. Retrieved July 24, 2016. ^ Kohler, Chris (March 11, 2007). "VGL: Koji Kondo Interview". Wired.com. Condé Nast. Retrieved July 19, 2010. ^ Life, Nintendo (November 20, 2010). "Feature: Slipped Disk - The History of the Famicom Disk System". Nintendo Life. Retrieved July 12, 2018. ^ Phillips, Ashley (August 7, 2008). "Researchers Propose $12 Computer for Developing Countries". ABC News. Retrieved July 19, 2010. ^ Edwards, Benj (August 7, 2007). "VC&G Interview: Brian Parker on RetroZone and the PowerPak NES Flash Cart". Vintage Computing and Gaming. Retrieved July 21, 2010. ^ Kohler, Chris (2004). Power-Up: How Japanese Video Games Gave the World an Extra Life. Indianapolis, Indiana: Brady Games. p. 29. ISBN 0-7440-0424-1. ^ Barnholt, Ray (April 7, 2010). "The Island of Lost Hardware: TVs With an NES Inside". Retronauts. 1Up. Archived from the original on October 19, 2012. Retrieved July 21, 2010. ^ "Breaking the Ice: South Korea Lifts Ban on Japanese Culture". Trends in Japan. December 7, 1998. Retrieved May 19, 2007. ^ "Nintendo Wii and DS to launch in India on September 30". Retrieved December 26, 2012. ^ Mike. "Nintendo World Class Service | Nintendo Player". NintendoPlayer. Archived from the original on September 7, 2013. Retrieved September 5, 2013. ^ Hilliard, Kyle (August 7, 2013). "Capcom's Golden DuckTales Promotional Cartridge Is Actually DuckTales". Game Informer. GameStop. Retrieved August 7, 2013. ^ a b c GameSpy.com – Article. Web.archive.org (March 20, 2008). Retrieved on August 23, 2013. ^ a b Keizer, Gregg (September 1988). "Games Hot, but Cartridges Cool". Compute!. p. 8. Retrieved November 10, 2013. ^ a b U.S. Court of Appeals; Federal Circuit (1992). "Atari Games Corp. v. Nintendo of America Inc". Digital Law Online. Retrieved March 30, 2005. ^ Kent, Steven L. (2001) . The Ultimate History of Video Games: From Pong to Pokémon and Beyond- The Story That Touched Our Lives and Changed the World (First ed.). Roseville, California: Prima Publishing. p. 400. ISBN 0-7615-3643-4. Wisdom Tree presented Nintendo with a prickly situation. The general public did not seem to pay close attention to the court battle with Atari Games, and industry analysts were impressed with Nintendo's legal acumen; but going after a tiny company that published innocuous religious games was another story. ^ The Morning Call – Article. Retrieved on August 26, 2013. ^ 1UP.com – Article Archived October 17, 2013, at the Wayback Machine. Retrieved on August 26, 2013. ^ SunSentinel – Article. Retrieved on August 26, 2013. ^ "The Nintendo Threat?". Computer Gaming World. June 1988. p. 50. ^ Kent, Steven L. (2001) . The Ultimate History of Video Games: From Pong to Pokémon and Beyond- The Story That Touched Our Lives and Changed the World (First ed.). Roseville, California: Prima Publishing. p. 347. ISBN 0-7615-3643-4. ^ a b Keizer, Gregg (July 1989). "Editorial License". Compute!. p. 4. Retrieved November 11, 2013. ^ Freitag, Michael (June 8, 1989). "Talking Deals; How Nintendo Can Help A.T.&T". International New York Times. ISSN 0362-4331. Retrieved February 7, 2015. ^ "Fusion, Transfusion or Confusion / Future Directions In Computer Entertainment". Computer Gaming World. December 1990. p. 26. ^ Nielsen, Martin (1997). "The Nintendo Entertainment System (NES) FAQ v3.0A". ClassicGaming.com's Museum. Archived from the original on October 6, 2008. Retrieved July 16, 2007. ^ McFerran, Damien (July 22, 2014). "Hardware Classics: Sega Master System". Nintendo Life. Retrieved September 13, 2014. ^ McFerran, Damien. "Retroinspection: Master System". Retro Gamer. No. 44. London, UK: Imagine Publishing. pp. 48–53. ISSN 1742-3155. ^ a b "International Outlook". Electronic Gaming Monthly (53). EGM Media, LLC. December 1993. pp. 96–98. ^ Turner, Benjamin; Christian Nutt (July 18, 2003). "8-Bit Memories, 1988–1994". GameSpy.com. p. 27. Archived from the original on May 20, 2009. Retrieved June 30, 2010. ^ "Nintendo's classic Famicom faces end of road". AFP. October 31, 2007. Archived from the original on November 5, 2007. Retrieved November 9, 2007. ^ McGill, Douglas C. (December 4, 1988). "Nintendo Scores Big". New York Times. Retrieved July 1, 2010. ^ "Smart Bomb: Inside the Video Game Industry". Talk of the Nation. November 14, 2005. National Public Radio. ^ "Nintendo Wins Emmy Award" (Press release). Nintendo. July 16, 2007. Retrieved October 24, 2007. ^ National Academy of Television Arts And Sciences. "Outstanding Achievement in Technical/Engineering Development Awards" (PDF). Archived from the original (PDF) on February 28, 2008. ^ Kohler, Chris (2004). Power-Up: How Japanese Video Games Gave the World an Extra Life. Indianapolis, Indiana: Brady Games. p. 57. ISBN 0-7440-0424-1. ^ Kent, Steven L. (2001). The Ultimate History of Video Games: The Story Behind the Craze that Touched our Lives and Changed the World. Roseville, California: Prima Publishing. p. 353. ISBN 0-7615-3643-4. ^ Kent, Steven L. (2001). The Ultimate History of Video Games: The Story Behind the Craze that Touched our Lives and Changed the World. Roseville, California: Prima Publishing. p. 357. ISBN 0-7615-3643-4. ^ Turner, Benjamin; Christian Nutt (July 18, 2003). 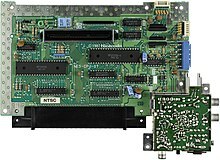 "8-Bit Memories, 1988–1994". GameSpy.com. p. 20. Archived from the original on May 20, 2009. Retrieved June 30, 2010. ^ Kent, Steven L. (2001). The Ultimate History of Video Games: The Story Behind the Craze that Touched our Lives and Changed the World. Roseville, California: Prima Publishing. p. 358. ISBN 0-7615-3643-4. ^ Kohler (2004), p. 95. ^ Kohler (2004), p. 222. 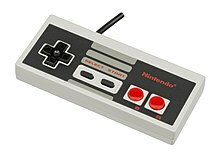 ^ "Retro NES USB Controller". Think Geek. Retrieved July 1, 2010. ^ Edwards, Benj (August 19, 2007). "VC&G Review: Nintendo Power Mints". Vintage Computing and Gaming. Retrieved July 1, 2010. ^ "Nintendo Controller Pop Art T-Shirt". Hot Topic. Retrieved July 1, 2010. ^ "Special edition Nintendo Vans prove your inner nerd never died". ^ Fayzullin, Marat "iNES". Retrieved on January 10, 2015. ^ "Nintendo Entertainment System – Nintendo Switch Online". Nintendo.com. ^ Biggs, Tim (July 15, 2016). "Nintendo announces mini NES console with 30 games included". The Sydney Morning Herald. Retrieved July 15, 2016. ^ Kamen, Matt (July 14, 2016). "Nintendo unveils the Classic Mini loaded with 30 NES games". Retrieved July 14, 2016. ^ Paul, Ian (July 14, 2016). "Nintendo's releasing a miniature NES console packed with 30 classic games". Retrieved July 14, 2016. ^ Ashcraft, Brian. "Nintendo Bringing Back The NES Classic In 2018". Kotaku.com. Retrieved August 8, 2018. ^ "15 Most Influential Games of All Time". GameSpot. p. 6. Retrieved October 24, 2007. 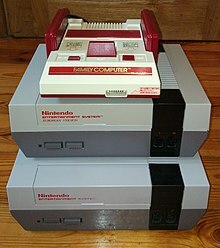 Wikimedia Commons has media related to Famicom and variants.